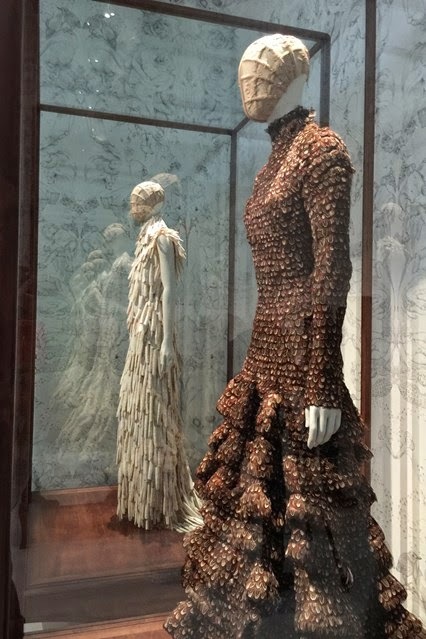 One of the things I love about fashion is the possibility of elevating it beyond pretty dresses to become an art form, and nobody does that better than Alexander McQueen. 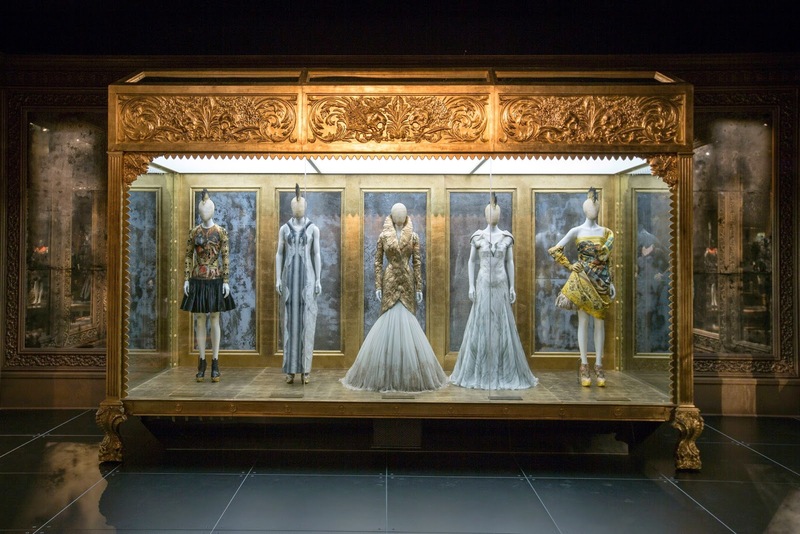 So when the V&A announced that they were hosting the Savage Beauty retrospective that had sold out in New York, I eagerly booked my tickets, and over the weekend trotted down to the V&A to see it for myself. 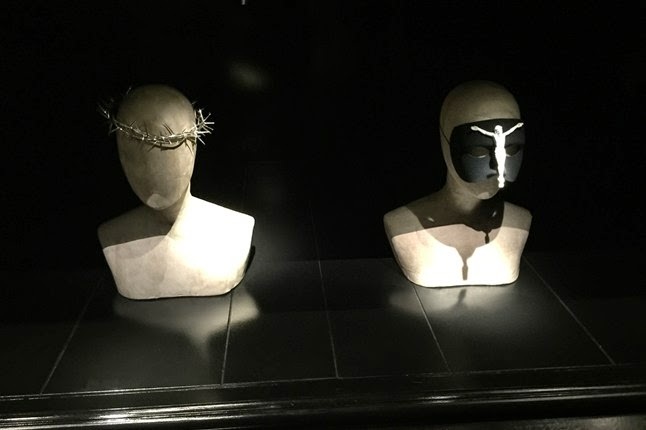 Unfortunately you're not allowed to take pictures inside the exhibition (contrary to what some press reviews have said), so apologies if this is a very wordy post! Rather than being a straightforward walk-through of McQueen's career, the exhibition focuses on the different themes in his work. 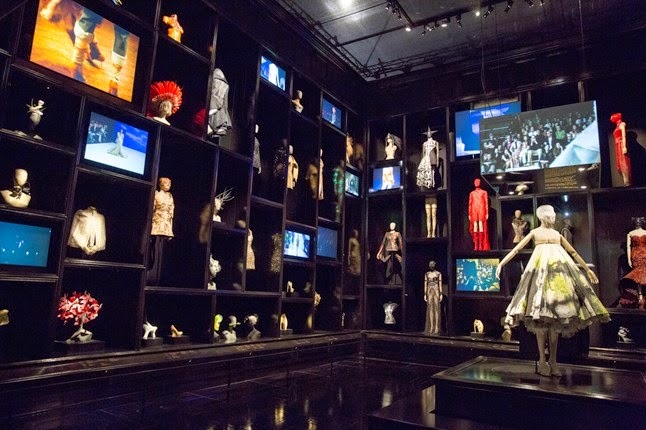 The opening room (after an amazing hologram of McQueen's face morphing into a skull) focuses on McQueen in London and his training as a tailor. 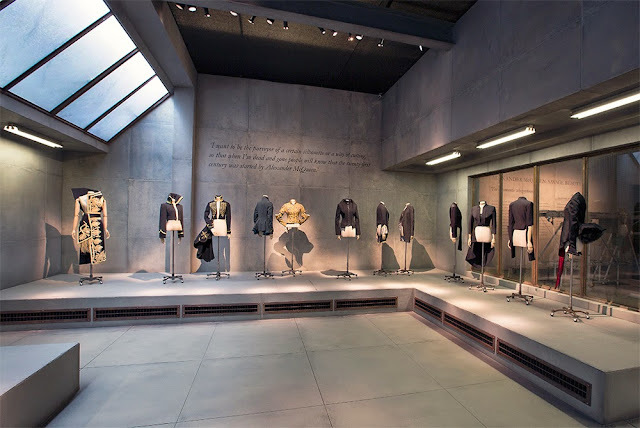 As well as the infamous low-slung 'bumster' trousers, there are some utterly beautiful jackets; I was particularly taken by a frock coat from his graduate collection with the tails at the front, a bustle like birds' feathers at the back and a slash of red lining. 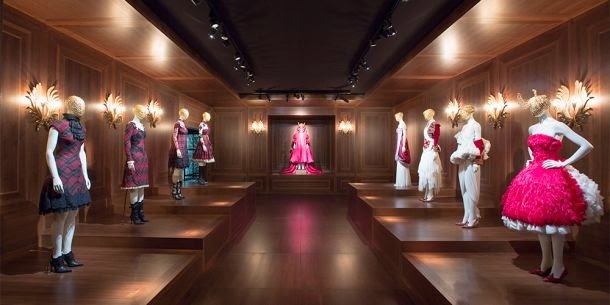 The room also provided a wonderful capsule summary of McQueen's main themes: tartan, tailoring, Britishness, nature, and juxtapositions - brilliantly mixing toughness and femininity. 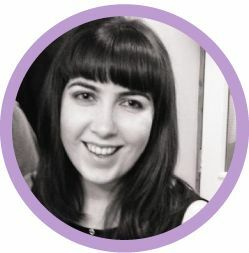 The second room had the feeling of being in a sinister old mansion, with classical music playing, wooden panels and tarnished mirrors. 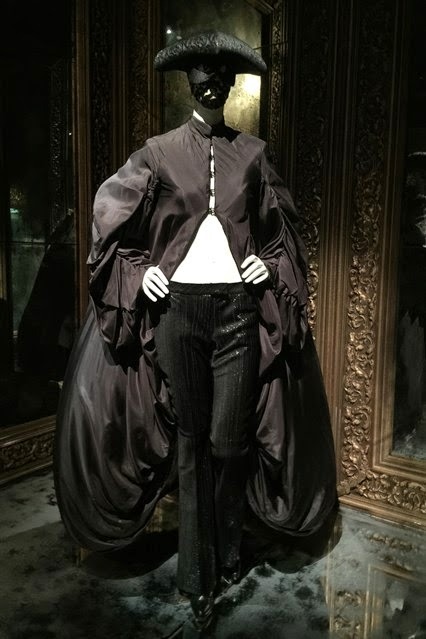 Apart from the opening room and the Cabinet of Curiosities (more on that shortly), all the rooms were themed around McQueen as a Romantic, in the 18th century sense of the word - embracing the beauty in even the darkest things. 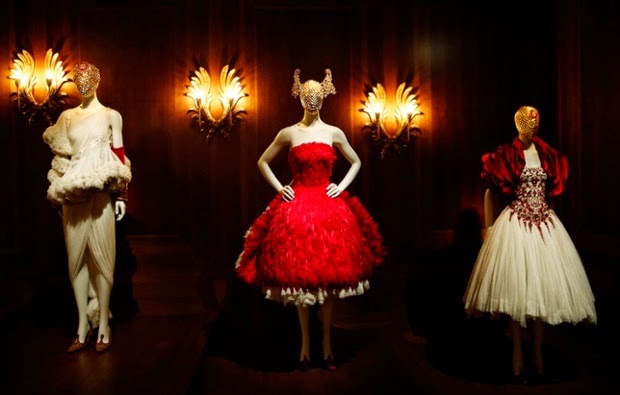 Both rooms were filled with beautiful pieces, including lots of feathers (such as one gorgeous gold feather coat and embroidered tulle skirt combination that wouldn't have looked out of place on Elizabeth I) and delicate beading and lace details on dresses, balanced out by studded pointed shoes and bird skulls on shoulders. McQueen once said he wanted people to be afraid of the women he dresses, and that definitely came through from this room. 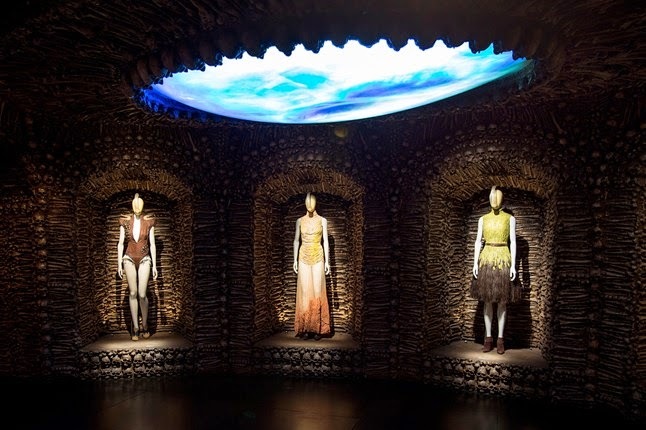 You're then taken into a room with walls of bones, giving the sense of being trapped underground in a fantastically creepy fashion, and find yourself in a room themed around McQueen's fascination with nature and tribal prints. 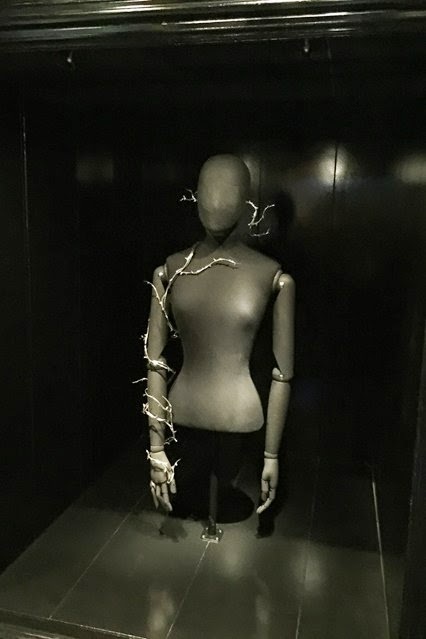 I really liked the cloudy perspex horns on the mannequins' faces; they look like weird breathing apparatus, turning the mannequins into otherworldly human-beast hybrids. 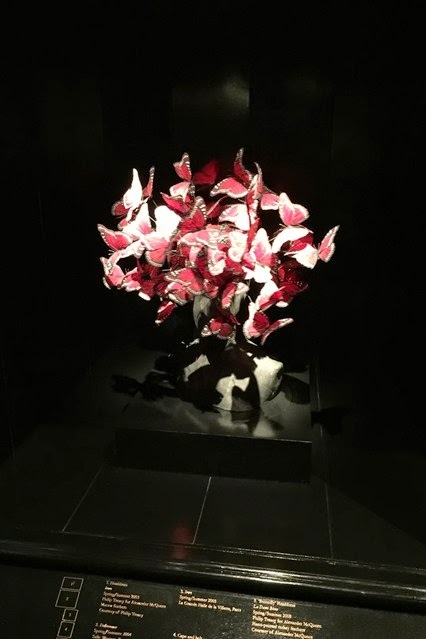 There is also an amazing ceiling installation which I won't spoil for you, but suffice to say it's a brilliant contrast to the main room and adds a great sense of otherworldliness. The next room was full of rich, opulent dresses, dominated by reds and golds, as well as some amazing work with the McQueen tartan to make the outfits wrap around the mannequins' curves. 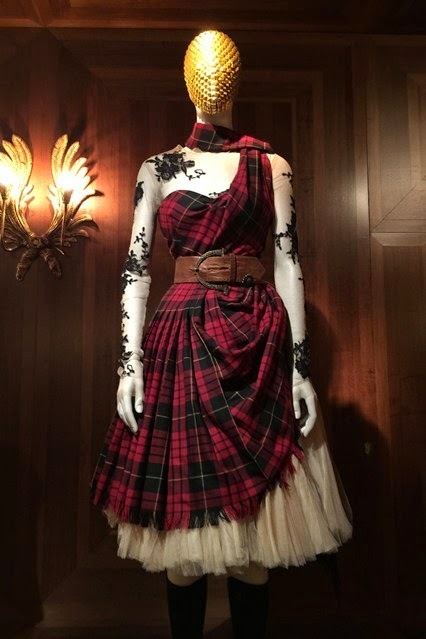 I particularly loved one one-shouldered tartan dress with see-through lace sleeves and petticoats and lace-up boots - it oozed modern Boudicca. 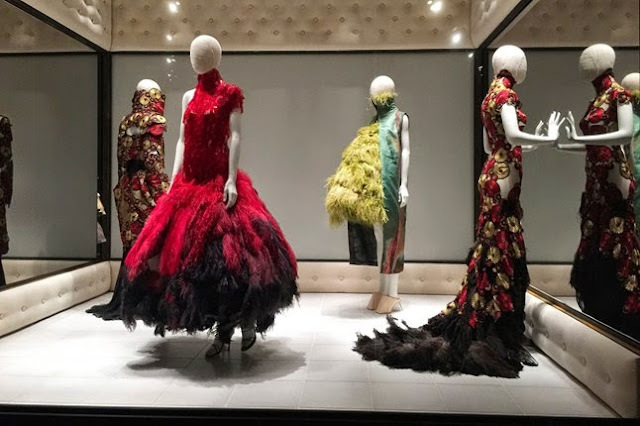 Equally there were exquisite girly white dresses, all tulle and frills with beads like drops of blood on the bodice, and beautiful frothy feathery creations. 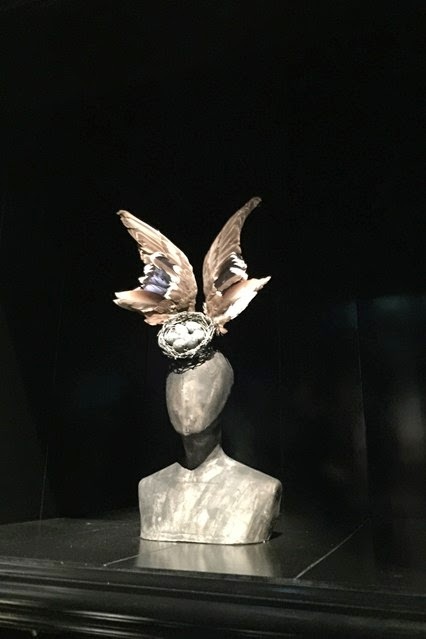 The Cabinet of Curiosities is the centrepiece of the exhibition and shows an array of amazing quirky pieces from McQueen and his longtime collaborators. It's filled with fabulous shoes (including the legendary Armadillo boots - I stood there for a good five minutes trying to contour my foot to see how you'd get them on), beautifully delicate jewellery packed with religious imagery and headwear covering everything from Native American-style headdresses to glittery birds' nests via African and Indian influences. 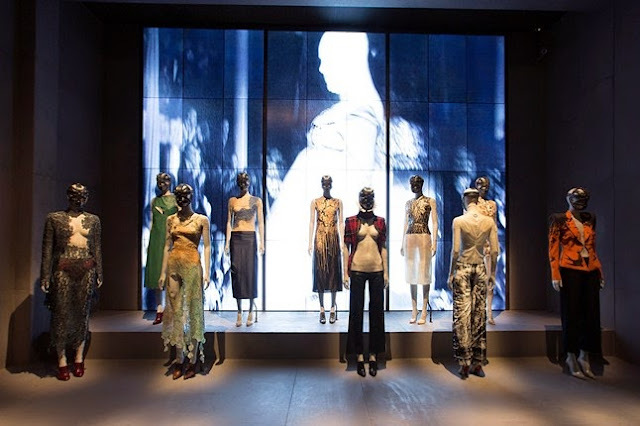 I particularly liked the video screens showing McQueen's catwalk shows - it really brought things to life in a way lots of fashion exhibitions don't. 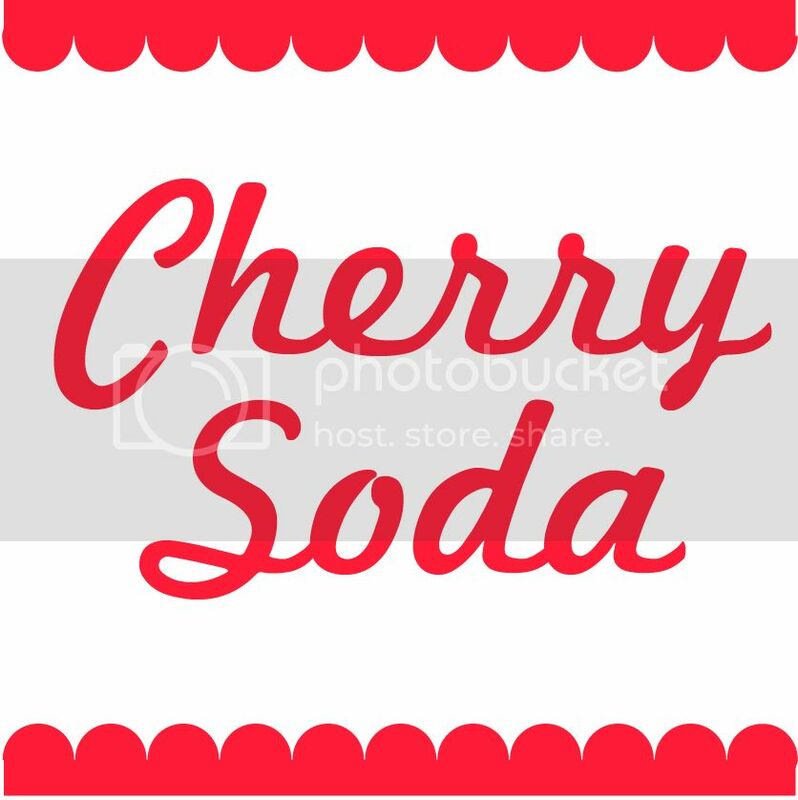 If you want the maximum experience, grab a seat in the middle besides the spray-painted dress spinning like a twisted ballet dancer, or just stop in a corner and look around to drink it all in. The exhibition then shifts to a more ethereal vibe with a room devoted to an image of Kate Moss from the Widows of Culloden show using an old trick called Pepper's Ghost - it's strangely sad yet utterly beautiful - and one looking at the impact of Asian culture on McQueen's work. 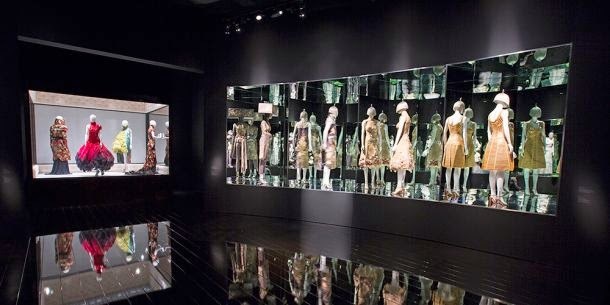 It also included a mirrored box containing four beautiful dresses from the Voss show, which when lit up created the impression of the models being trapped. There's also a massive surprise at the end of the sequence but again I won't spoil it for anyone attending! 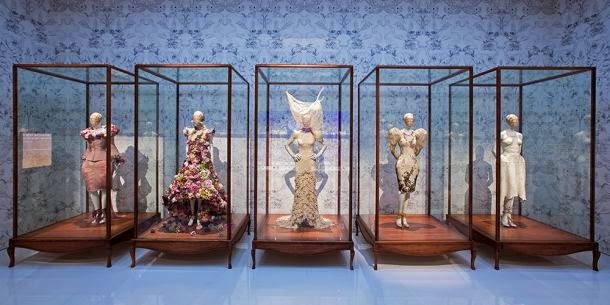 Finally, you come out into a room focussing on McQueen's relationship with nature, which is packed with gorgeous pieces such as dresses made of flowers and razor clam shells, yet also contrasted with reminders that everything dies and decays, such as cobweb-like veils draped over antler headdresses. 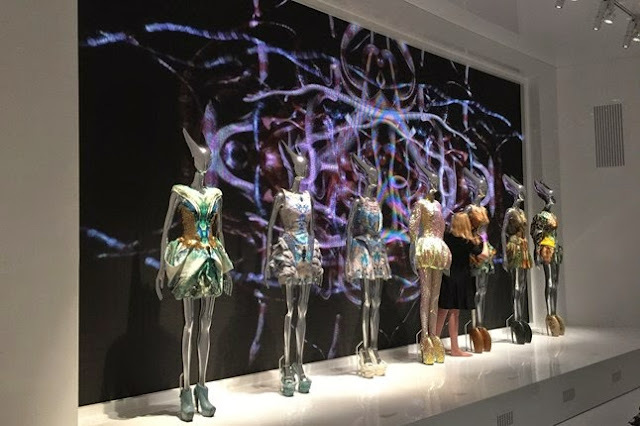 The exhibition closes with outfits from McQueen's final show, Plato's Atlantis, with exaggerated hips and shoulders and the most amazing digital prints of sea creatures on the dresses, along with a copy of the video installation from the show that is quite literally a wall of sound. 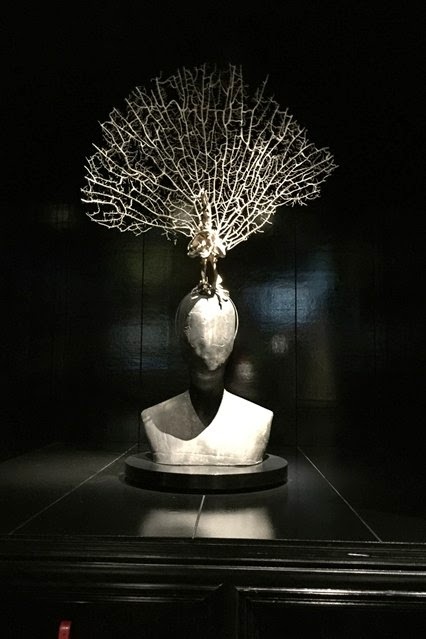 Overall I thought Savage Beauty was an amazing exhibition - it really is like stepping into another world and, when you eventually emerge, feeling like everything has somehow shifted. 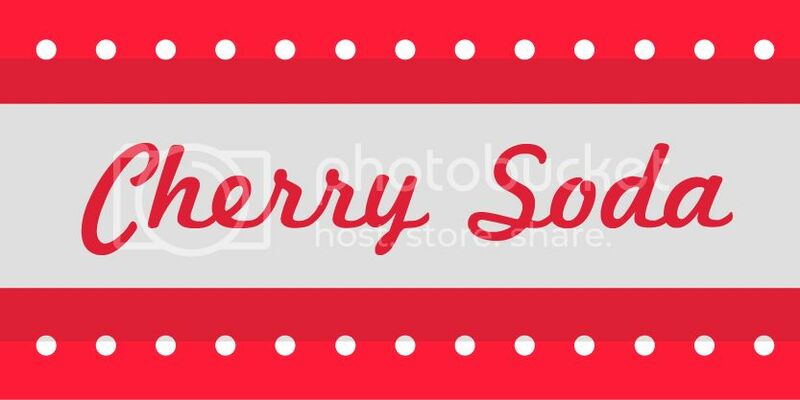 Even now, over 24 hours later, I'm still thinking about everything that I saw in there and trying to piece it all together, but it's something that's going to stay with me for a long time; there is just so much in there that it almost becomes overwhelming. 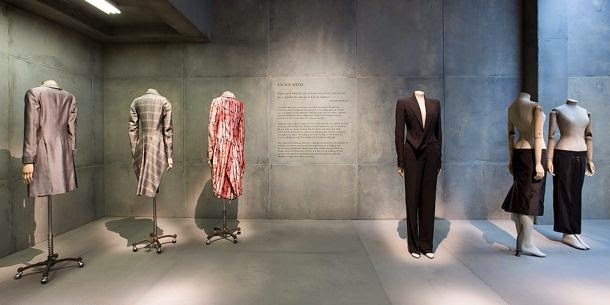 It's provocative and shocking, yes, but it's also about the power of fashion to transform and redefine. As the last quote on the wall says, it takes you on journeys you never thought were possible, and they're completely amazing. 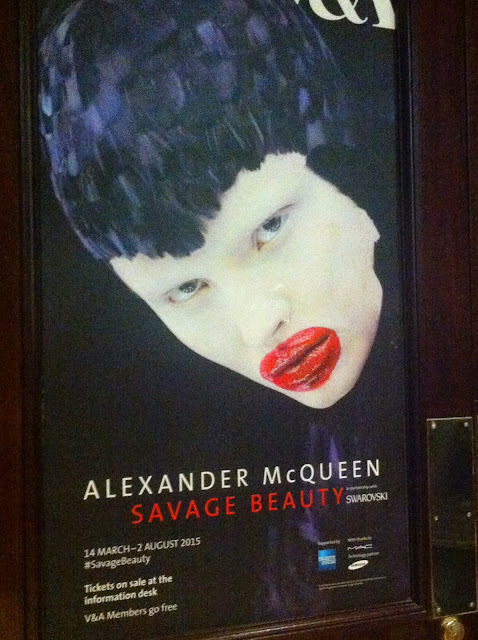 Alexander McQueen: Savage Beauty is on at the V&A until 2nd August and there are still tickets available - you might have to queue up on the day but it is totally. 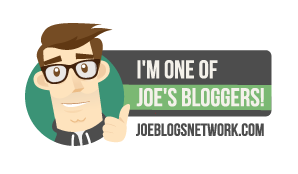 utterly worth it. Go go go!